Sweetly compact blueberry pie theme enlivens embittered fruited hop fizz and brisk mineral water flow of great medium-bodied amber ale. Wheat wafer wisp wallows inside raspy huckleberry-banana-lemon thicket and precarious herbal clove-mint innuendo. 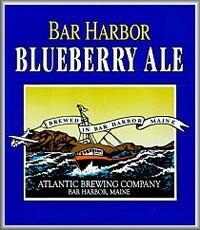 Preferred over souring Sea Dog Blueberry Wheat as tart dessert sipper. On tap, massive blueberry-seeded tartness overrides arid hop acridity to honeyed wheat bottom.